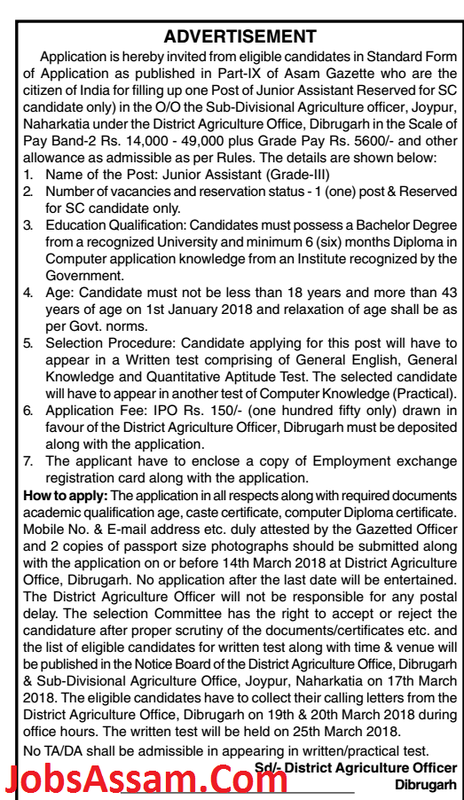 Application is hereby invited from eligible candidates in Standard Form of Application as published in Part-IX of Assam Gazette who are the citizen of India for filling up one Post of Junior Assistant Reserved for SC candidate only) in the O/O the Sub-Divisional Agriculture officer, Joypur, Naharkatia under the District Agriculture Office, Dibrugarh. No of Vacancy: 1 (one) post & Reserved for SC candidate only. Education Qualification: Candidates must possess a Bachelor Degree from a recognized University and minimum 6 (six) months Diploma in Computer application knowledge from an Institute recognized by the Government. Age: Candidate must not be less than 18 years and more than 43 years of age on 1st January 2018 and relaxation of age shall be as per Govt. norms. Application Fee: IPO Rs. 150/- (one hundred fifty only) drawn in favour of the District Agriculture Officer, Dibrugarh must be deposited along with the application. Selection Procedure: Candidate applying for this post will have to appear in a Written test comprising of General English, General Knowledge and Quantitative Aptitude Test. The selected candidate will have to appear in another test of Computer Knowledge (Practical). How to apply: The application in all respects along with required documents academic qualification age, caste certificate, computer Diploma certificate, Mobile No. & E-mail address etc. duly attested by the Gazetted Officer and 2 copies of passport size photographs should be submitted along with the application on or before 14th March 2018 at District Agriculture Office, Dibrugarh. Note: The applicant have to enclose a copy of Employment exchange registration card along with the application.